A flexible ironwax bow created by the Felwasp Guards to defend their larvae from assailants. A curious bow that sacrifices some damage for one more shot than the Bow of Covert Havens. The Crossfire outdamages said bow on enemies with up to 65 Defense, the Coral Bow up to 59 Defense, the Thousand Shot up to 49 Defense, the Doom Bow up to 38 Defense, the Leaf Bow up to 33 Defense, and the Void Bow up to 5 Defense. However, all four shots from the Crossfire must land in order to obtain this fearsome DPS; as such, the Nectar Crossfire is best utilized in close-quarters combat where damage and accuracy is not an issue. Interestingly, the arrows from the Crossfire do not follow a straight path - rather, they have a slight wavy pattern that causes them to curve when fired, creating a criss-crossing pattern of arrows. 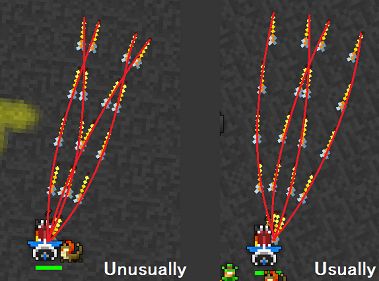 Savvy players can exploit this unique pattern to increase damage dealt while still remaining at range; however, the small hitboxes of most enemies still necessitate close proximity to foes in order to reach peak damage out put. Oddly, activating an ability or firing an odd amount of projectiles in between using this bow will cause its firing pattern to change. This is the result of an anomaly in the game’s code that alternates each shot fired between a “positive” and “negative” sine wave. The Pfiffel DPS tool displays this bow’s true range as 2.7 tiles. However, the amplitude of the shots causes the true range to be much shorter: 1.2 or 2 tiles, depending on the shot pattern the bow is currently set to.